The Strong SRT8000 is an older - but cool - digital satellite receiver. In the meanwhile a new model, the SRT8100, is taking it's place. The procedure below is suitable for these models as well, only they DO require a different version of the firmware. The fun with the SRT8000 is that cool dudes like Emper0r, Imagica and H2Deetoo, managed to tweak the firmware a bit so additional functionality has become available. Some of these new functions involve the support of multiple encryption techniques (Irdeto, VIA-Access, BetCrypt, etc. 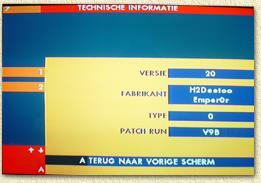 ), more channels (this used to be 999, but with version 9 we came to 2002 channels! ), a nicer way of presenting information and more ... in short: compliments to Emper0r, Imagica and H2Deetoo for a job very well done! Tip: it is said that the Strong SRT8000 firmware is suitable for the Nokia 9302S using the Strong loader software. Tip: when planing on using firmware version 9, it is advisable to flash firmware V20 first. Please do READ the disclaimer! During the life-cycle of the Strong SRT8000 several firmware versions became available. This is an oldie - it's an official Strong release - rather not use it, since it can't handle the weird things one or more movie-providers are transmitting ... instead use at least V20 or version 9. Als an original, download it here, I can't confirm if this is a working version for the SRT8100 as well (mail me confirmation if it does!). You'll need this version if you are going to flash the firmware of the Strong (it comes with the loader). the most recent version: Strong SRT8000 (version 9b FINAL incl. channel settings). a good version, made just before version 9. What do we need to be able to update? This should be a cable with at both ends a 25 pin DSub male connector (See Connector A below). This should be a regular serail cable, as you would use for connecting your modem to your computer. One end has a DB-9 connector male (see Connector C) which should be put into the COM-port of your PC, and the other end should have a DB-9 female (see Connector B) for connecting to the reciever. The most recent version can be found at the official Strong website, or download version V20 right here which includes both loader and firmware V20. Other version will become available over time, check Sat4all. ALL versions will erase your channel-list! The version with a channel list however will save you a lot of time searching and sorting channels. After downloading the loader-software and firmware (download version 20 including loader-software and/or just firmware patchrun Version 9 by Emper0r) the loader-program must be installed. Note: when planning on flashing version 9, you will need both files! Extract the "strong8000firmware20official.zip" file for example with WinRar or WinZip. Double click the unpacked file "Software Loader and V20 Firm (Official).exe" so the loader-software will be installed on your PC. Follow the instructions and finish the setup. We're not done yet! We still need to add a generic printer. Go to "Control Panel" and choose "Printers" (older Windows versions: go to "My Computer" and choose "Printers"). No click the "Add new printer" icon and choose a "local" printerport at "LPT1". No choose the brand called "GENERIC" and model "GENERIC/TEXT ONLY". Mke this your "Default printer" and DO NOT PRINT A TEST PAGE! We will now hookup the receiver to the computer using the cables we mentioned before. In the image on the right, you see the backside of a Strong SRT 8000. Connect the serial cable with the male DB9 to connector A. Connect the other end of the cable to a com-port. I presume you will be using COM1, but others will do fine as well. Note: Only COM1 and COM2 are supported! Connect the parallel cable to B. Connect the other end of that cable to the printer-port of your PC. Note: in the lower left corner, it should say "Printer: Generix / Text Only" indicating that you have done a good job on setting the printer we just installed. If this is NOT the case, then you either didn't install the printer or forgot to make it your default printer. Quit the loader program and fix it! Select the "COM" menu and choose "COM1" (unless you connected the serial cable to a different com-port - then you select the proper one). Now click the menu "FILE" and choose "bin_file_to_load". A dialoog appears. Go to the directory where you unzipped the firmware. When flashing version 9 (the one you downloaded from this website) the file to select should be "Str8000 v9b FINAL (incl settings).BIN" select it and click "open". Now, on the receiver hold the buttons ">" (arrow to the right) and "MENU" pressed and keep them pressed while switching the receiver on until the receiver's display show either "CHA" or "CHAr". The loader-software shows some response too, indicating it found the Strong. NOTE: text will be different for each receiver and firmware! NOTE: whatever ahppens: NEVER SWITCH THE STRONG OFF WHILE UPDATING! (see Disclaimer). The receiver will AUTOMATICALLY SIWTCH OFF and ON again (display will either show time, channel number or "--:--"). Now you can un hook the receiver from your PC and test the receiver. When you used a firmware with a channellist, only a few menu items will work, since you need to install the channels first ... EACH update will erase ALL channels. In the "MENU" - "Technische informatie" (=7) - "Decoder Versie" (=2) you will see the current version (sorry: I don't know if the menu will appear in other languages). Note: Don't forget to set the clock of the receiver (date and time) otherwise EPG and program-info will not work properly!